Convert and Translate Pro Engineer (ProE, Pro/Engineer), Creo CAD and PVZ ProductView files to 3ds Max, Cinema 4D (C4D), Unity (virtual and augmented reality, VR/AR), SketchUp, Maya, LightWave, U3D, Acrobat, FBX, COLLADA and more. Questions? Please email our CAD system software architect. For over 23 years Okino Computer Graphics has provided the absolute defacto Pro/E & 'Creo Elements/Pro' conversion system used throughout the world by our user base of many tens of thousands of 3D professionals for mission and application-critical applications. We utilize an embedded version of the actual Pro/E & Creo software inside of Okino's software, allowing for 100% error free import of native, encrypted Creo assemblies, part files and instance accelerator files. There is technically no other more ideal or error free conversion pipeline available for native Creo data. No intermediate file formats are used nor are reverse engineered CAD toolkits used to access the Creo data. Please take a moment to review the Okino Granite Importer overview, which explains how the embedded PTC Granite technology relates to this Okino CAD importer pipeline and click here to view Okino's Creo importer online help, feature list and option descriptions. Important Note: are you being told on forums or by others to invest in a Creo converter costing $1200 and up, thinking that cost equates to something special or better? Unfortunately the world of CAD conversion has been rife with hypocrisy and misleading advertising + information for decades (especially on forums where people trade incorrect information or insiders promote their own expensive product offerings). These $1200 and up solutions use reverse-engineered technology from France and India, and do not utilize the real PTC Pro/Engineer + Creo technology that Okino has licensed for decades. You are paying these inflated prices due to the hidden, back-end double licensing costs from secondary, reverse engineering companies and hence are not obtaining a 1:1, streamlined and lossless conversion. Most people can't tell an apple from an orange in the world of CAD translation software, whereas at Okino we fully educate and train our new + existing users about the proper way to do such conversions. Our ProE/Creo module is highly subsidized through Okino's OEM revenue stream at only US$395, not 6 times that number as sold by other vendors who do not actually provide native ProE/Creo conversion technology. Also, keep in mind that resellers and dealers will always want to sell you the most expensive solution available because they can make upwards of 50% of that price as their take-home profit. Okino software has always been priced fairly so that all mid- and high-end professionals can easily gain access to the best conversion technology on the market. 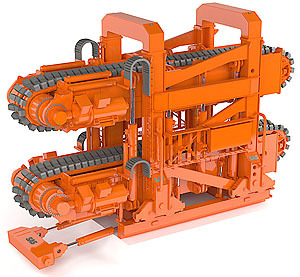 Also, be on the watch for companies offering "clean up" tools along with their CAD importers - our native CAD importers bring in the data properly, such that face flipping and associated clean-up is technically not needed, when sourced from a BREP manifold solids native CAD file (as all files should). This CAD pipeline solution allows complete Creo parts and assemblies to be converted cleanly and professionally to all other major 3D file formats, animation packages, virtual reality (VR) and augmented reality (AR) systems (such as Unity and Unreal Engine), and visual simulation programs. It also allows all disparate departments of large enterprise companies (such as engineering, design, marketing and support) to easily exchange product data without the need to rebuild their CAD datasets -- downstream uses include product documentation and manual creation, animation and rendering software, visual communication and review of data, and for accessing easier to manipulate versions of the original CAD datasets. Okino's Creo CAD conversion pipeline is synonymous with moving complex Creo assemblies into VR/AR for Unity & Unreal, 3ds Max, Cinema-4D (C4D), Maya, LightWave, Blender and many common downstream 3D applications. In addition, Okino's Creo conversion system is used in conjunction with many OEM and third party vendor integrations, and for re-purposing Creo assembly data into all major 3D downstream 3D file formats such as COLLADA, DirectX, DGN, DXF/DWG, FBX, HOOPS/DWF-3D, JT Open, NGRAIN, OpenFlight, OSG/IVE, PLY, Rhino/OpenNURBS, SketchUp, U3D (Acrobat-3D, 3D PDF), VRML1+2+X3D, Wavefront OBJ, XAML-3D, and XGL. The software can also be used to convert source data from PTC's 'Creo Elements/Direct Modeling' (previously called Co-Create) and PTC 'Product View' visualization files (.PVZ, .PVS, .OL). Okino's NuGraf software provides additional support for photo-realistic rendering and scene composition, 3D data and hierarchy optimization and built-in polygon reduction for handling those truly huge scenes that other downstream applications can't handle without reduction. Click on any image to see full size rendering and copyright information. Visit our Customer Image Gallery for more images derived from ProE/Creo data. They have been written to handle complex and large CAD data from their inceptions in 1988. As such, they can easily import huge assemblies and not become bogged down during interactive data manipulation or during its scanline/ray-trace rendering. Other animation and rendering packages, not designed originally for CAD data, will often slow down when a large number of objects exist in the scene. Try our demo and see for yourself that indeed NuGraf and PolyTrans are efficient and easy to use packages for Creo data. Okino has licensed the core Pro/Engineer + Creo software from PTC, known as the PTC Granite BREP-solids Kernel, so that assemblies, part files, colors and hierarchy can be read natively and directly from Creo datasets. This Creo importer is available as one component of the Okino Granite/Pack license. 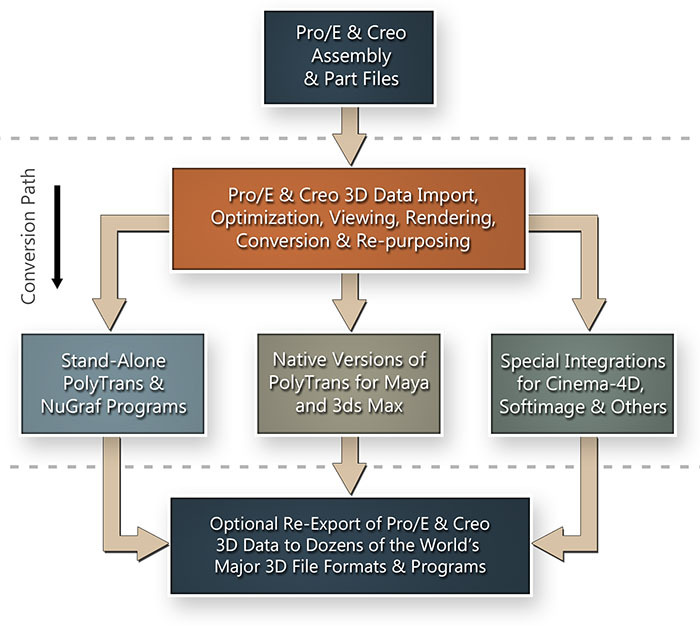 NuGraf, and its sibling product PolyTrans, are also used the world over to convert native Creo assemblies and parts to dozens of other major 3D file formats. If you already own a major 3D modeling or animation package then NuGraf or PolyTrans can move Creo data into these packages via a wide variety of supported 3D export file formats. Moving complex Creo assemblies into any and all major 3D animation packages to allow access to the plethora of excellent animation features from programs such as 3ds Max, Cinema-4D, Maya, LightWave and others. Conversion and down-sizing of complex Creo CAD assemblies into Virtual Reality (VR) and Augmented Reality (AR) applications such as Unity and Unreal Engine. Provides extreme compression of Creo CAD datasets into light weight models for visualization with Microsoft HoloLens, HTC VIVE, Oculus Rift, Meta and other forthcoming VR headsets. Direct import of Creo assemblies from within the user interfaces of 3ds Max and Maya via the special native PolyTrans-for-Maya and PolyTrans-for-3dsMax plug-in systems. These have been very popular conversion pipelines to our customers. Once the Creo data has been imported into PolyTrans or NuGraf it can be optimized, reduced in complexity, photo-realistically rendered (as well as have lights, cameras, materials, textures and uv-texture coordinates assigned) then re-exported to all major 3D file formats. Okino has been the recognized industry leader in 3D data translation and re-purposing for the last 3 decades so all of this software is highly refined and robust. Import into Okino's own NuGraf package (elder and more complex version of PolyTrans) for faster and more accurate rendering + scene layout. This package has been refined over the last 25+ years. 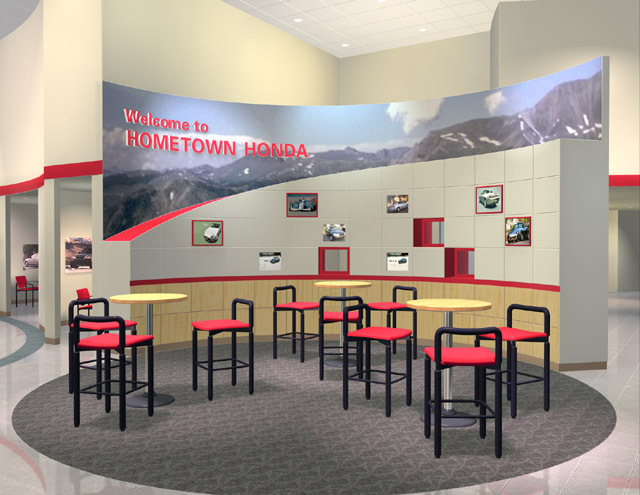 Some of our favorite customer CAD renderings created with NuGraf can be found here.